AN ASSOCIATION REPRESENTING Irish Catholic Bishops has sent a formal complaint to RTÉ about a Mario Rosenstock sketch that it claims is “grossly offensive to all Catholics”. Martin Long, Director of the Catholic Communications Office, sent a letter and email to Glen Killane, Managing Director of Television, RTÉ and Steve Carson, RTÉ Director of Programmes, on Friday. Long told TheJournal.ie that RTÉ confirmed for him on Friday that it had received the complaint. The formal complaint concerns the Mario Rosenstock Show broadcast on Monday 26 November 2012, at 9.30pm on RTÉ Two television. 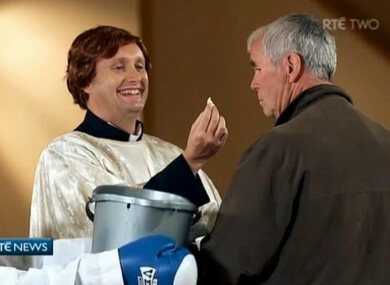 It specifically is in relation to a sketch which mentions the Olympic boxing medal winner Katie Taylor (who is not shown in the sketch), and “shows a man spitting into a bucket before receiving Holy Communion”. The complaint and calls this “grossly offensive to all Catholics” . Long does say in the letter that he is “not suggesting that the Church is beyond humour by comedians”, but that “a line must be drawn at some point”. He also stated that the CCO has received complaints from members of the public concerning this broadcast. He asks that RTÉ Two television broadcast an apology at 9.30pm this evening and also that it remove that specific sketch from the RTÉ website. “In addition, I ask that you please consider the core beliefs of Catholics before broadcasting content which may cause offence to Church faithful,” Long concluded. Email “Bishops claim Mario Rosenstock sketch is "grossly offensive" ”. Feedback on “Bishops claim Mario Rosenstock sketch is "grossly offensive" ”.